1st picture: The nearly complete chassis hanging sideways to finish tack-welding the floor panels in place. The center of the chassis has removable aluminum panels so that the bottom of the car is completely flat and fairly smooth. The wheels, 19″ in front and 18″ in back, were custom made by HRE. 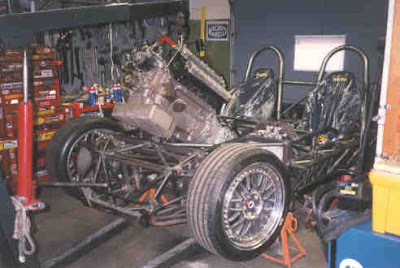 2nd picture: Test fitting the engine and trans. 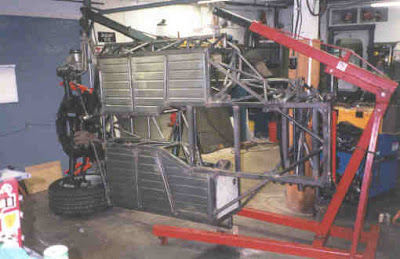 The chassis still had the earlier roll bars here. After a while I didn’t like them any more and cut them off to install smaller, more discreet roll bars. 3rd picture: Complete but unpainted chassis with drive-train, suspension, etc, fitted.